Food-borne diseases and bacteria are a concern at factories dealing with various forms of food, beverage and bio-pharma products, using the same machines. While all the plants in these industries have CIP (clean in place) systems to ensure that the machinery is washed in-between processes, there is always that possibility that they are not 100% clean. Anderson-Negele understands these concerns and has designed turbidity and conductivity sensors to manage these issues. The ITM-3 and ILM-4 sensor ranges makes the job of avoiding cross-contamination easier. The traditional methods used to require a strict step-by-step timing process, which relies on human intervention. Besides human error, there is also the possibility of loss of product and wastage of energy, water and chemicals, which invariably raises overall costs. Automating the CIP process with Anderson-Negele’s sensors takes the overheads away and ensures efficient and reliable outcomes. Time saving: most CIP processes take between 60 and 90 minutes. With an automated system, users can reduce this production downtime. 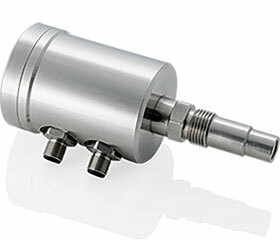 A more productive plant can be realised simply by applying one of these sensors meters to a process. Water saving: there are certain media, such as pasty types, that need considerably more water for cleaning, than viscous media. The problem is that with general CIP the same amount of water is used for all media cleaning. The automated process control using conductivity and turbidity sensors from Anderson-Negele monitors and reduces water usage. Product losses minimised: statistics show that, most times, the milk losses in large dairies edge on 0,5%, and in smaller plants, a staggering 2,5%. An automated system can bring these losses down by 5-10%, especially using the Anderson-Negele turbidity meter ITM-3. Savings overall: For interested users, a report is available from Anderson-Negele called ‘Achieving high savings potential with turbidity meters’, which gives the statistics on how savings can be achieved.